Best Views In Chicago is one of the best way to really see Chicago, to really appreciate it, is to see it from a distance. The views of this Windy City are truly breathtaking. But where is the best place to see it from? We have collected the best locations to get that epic panorama view over Chicago. Trust us, you will not be disappointed to do these things in Chicago. 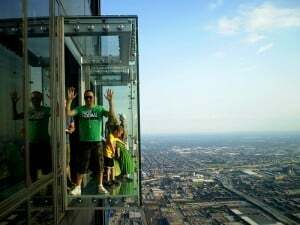 Standing 103 floors above the ground at the top of Willis Tower (Sears Tower), the Skydeck offers the most unique view of the city – from inside the building. Standing in a glass box extended just under four-and-a-half feet off the side of the third tallest building in the world is a breath taking experience. If you get to the John Hancock building before March 31 you will have an opportunity of a lifetime: the ability to ice skate at 1,000 feet inside a building! The view from there is amazing, but the view from the Lavazza Espression Café is even better. Serving a variety of coffees and wine and spirits, at night this is the ideal spot to relax and watch the skyline light up. Already seen the view from the top? How about the view from the water? There are a number of boats and architecture tours that will give you the inside scoop on Chicago’s unique architectural history. From the ground up you will be able to see how some of Chicago’s most famous buildings fit into the landscape of the city. Whether it’s the view from the lake or on the Chicago River, both are sure to impress. Inside the expanse of Grant Park, Buckingham Fountain creates one of the most well known symbols of Chicago. Shooting jets of water up to 150 feet into the air, the fountain is one of the largest of its kind in the world. Located in Grant Park the view is also well known as part of the opening for the television show, “Married with Children”. 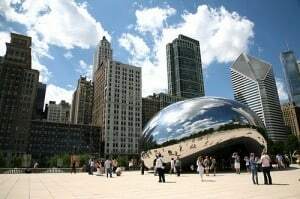 If you don’t know “The Bean”, you need to get to Millennium Park stat! Officially named “Cloud Gate,” this polished reflective sculpture in the heart of Millennium Park is a must see for those looking to grab an incredible view of the city skyline through a work of art. The view of the ivy covered walls from inside one of the oldest Major League Baseball stadiums in the country, Wrigley Field, is an amazing experience. The view from the rooftops across the street is even better. The Wrigley Rooftops give baseball fans the most extraordinary stadium experience. Above the field viewers get a birds eye view of the Wrigleyville neighborhood made famous by the city’s most loveable losers, the Chicago Cubs. Located just north of the Magnificent Mile the Oak Street Beach, on the shores of Lake Michigan on of the Great Lakes, provides a wonderful opportunity for a classic Chicago photo of the Drake Hotel Chicago. From the beach you can snap great shots of the downtown area and the city’s most famous street, Lake Shore Drive. If you don’t feel like going out of your way to get a nice view over the city, there are some pretty neat Chicago condos where you can soak up the view without even having to step outside your door. I find it amazing that we can still find beautiful sights within metropolitans and modern cities. 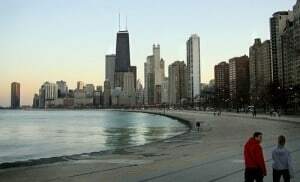 Chicago is one of the world’s metropolitans offering such wonderful sights and it’s great that you have these tips as to where we can get great views! that skydeck looks scary, but would offer an amazing view of the city. it is great to know cities can offer such views as well as nature. These are all great tips! I visited Chicago for the first time in September and I highly recommend Willis Tower and especially John Hancock Observatory at night because there is a bar up at the top, perfect for drinks and dessert while you watch the nighttime lights. yes it is amazing, some cities are really beautiful with all their lights and high rise buildings with reflecting windows. I know, but pretty cool huh? I’d love to try it myself. Thanks for sharing your thoughts about the views. Nice I love the views of the city from up high especially at night. 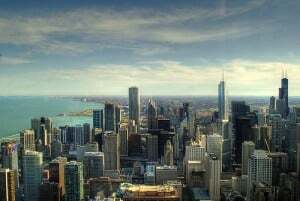 Chicago i hear is an awesome place to visit I will make sure to check out some of the views from some of these locations. Great picks… I second all of them, particularly the architecture tour. Thanks Scott, the architecture tour seems really cool. Glad to inspire you Amelie! Have a great time there. Awesome! This couldn’t come at a more perfect time, either, as I’m headed to Chicago for the very first time next weekend! Chicago is famous for its awesome views all over the world….It is always my personal favorite place to enjoy the holidays…..The post here itself shows where we can find the great views…. Awesome, hope you have a great weekend in Chicago!